Indian names: soh-shur, soh-jhur, chalthei (Assam); kainth, chotia. kainth, shegal (Himachal Pradesh); mahal mol (Hindi); mehol mol (Kumaon); passi (Nepal); kainth, shegal(Punjab). Kainth is a wild growing fruit of common occurrence in the mid-hill region between 700 and 2,000 metres above the mean sea-level. Thousands of these trees are found growing on the bunds of fields, grasslands, meadows and forests. The trees are spiny and are some times used for fencing by the farmers. 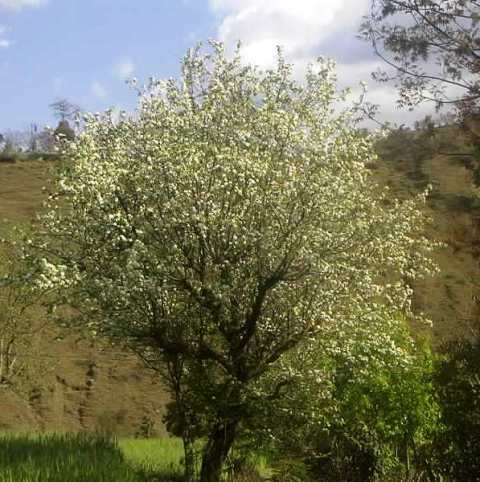 They are also used as a rootstock for pears in the hills. 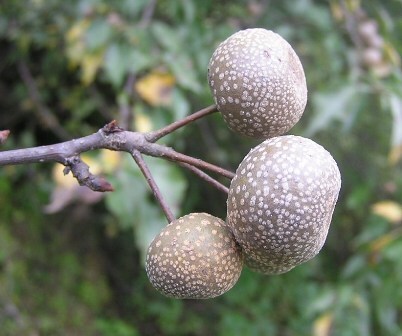 The small fruits, which are gritty, are eaten when ripe. They are very soft and highly perishable at full maturity and, therefore, they cannot be transported. Hence the question of their being sold does not arise. The fruits are tasty even when dried and can be eaten in that state. 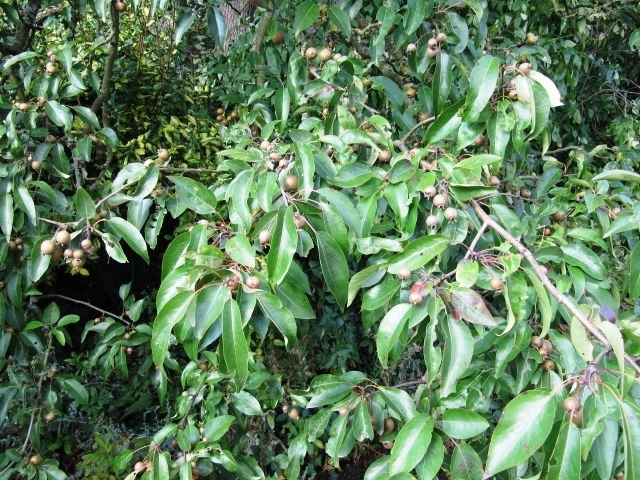 A tall, thorny, open-headed tree, 9.7 metres, high, with dark brown to black bark which can be stripped off in big patches; wood, very hard; newly emerging shoots, pubescent and light green; one-year-old branches also pubescent; older branches, smooth; internodes, 2.5 cm long; the girth of a fully grown tree, 87.5 cm. Leaves, stipulate, petiolate, having 2 to 3.5 cm long petiole, crenate, reticulate crenate, ovate to lanceolate; apex, acute to acuminate; length, 4.5 to 11 cm; width, 2.5 to 4.2 cm. Leaves arise in alternate pattern on one-year-old shoots. On two-year-old branches, a single leaf, with a stipule, arises laterally on each node. A thorn is always present in the axil. The thorn also bears 2 to 30 alternate, pubescent leaves. 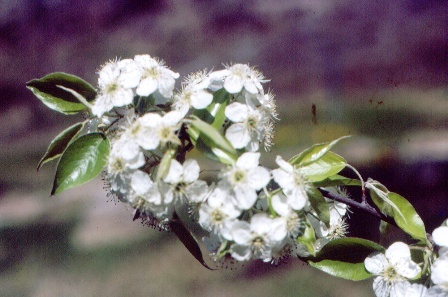 In the case of older wood, 5 to 7 leaves are present on the fruiting spurs. Flowers, pedicellate, ebracteate, actinomorphic, cyclic, hermaphrodite, epigynous, white; diameter. 2.5 to 3 cm; flowers borne on spurs, each spur bearing 3 to 11 flowers; calyx, gamosepalous, with 5 sepals, regular, companulate, pubescent, deciduous, 3 to 5 mm long above union; corolla, polypetalous, with 5 petals, rosaceous, white, having 1-to-7cm-long petals, with imbricate aestivation; androecium, with numerous stamens (26 to 42), polyandrous; gynoecium, 3 to 5 carpelled, syncarpous; ovary, inferior and hairy. 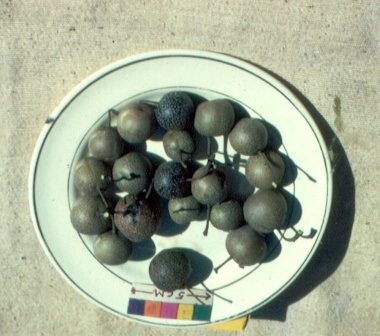 Fruit, a pome, oval, 1.7 to 2.5 cm in diameter; weight, 8.20 g, volume, 6.75 ml; unripe fruits, willow green 000862, black at maturity; numerous brownish dots present on the fruit surface. Seeds, pyriform, black, 5 in a fruit, 7 mm long, 2.5 mm broad, weight, 21 mg; volume, 37 microlitres. The flowering season was observed to extend from the last week of February to the middle of March. The fruits begin to ripen from the first week of November and continue to do so till the last week of December. A full-bearing tree yields about 45.5 hg of fruits. The fruit contains: moisture, 62.0 per cent; total soluble solids, 31 per cent; acidity, 0.97 per cent; total sugars, 6.85 per cent; reducing sugars, 6.79 per cent; non-reducing sugars, 0.04 per cent; tannins, 0.42 per cent; pectin, and vitamin C, 1.22 mg per 100 g of the pulp. The ash and protein contents of the fruits were observed to be 0.988 and 3.68 per cent respectively. The percentage contents of some of the mineral elements in the fruit are phosphorus, 0.026; potassium, 0.475; calcium, 0.061; magnesium, 0.027 and iron, 0.006. The fruits are soft and sweet. They are gritty and also, slightly astringent. The overall fruit quality is poor. The fruits of kainth are edible and are used by everybody. They are very soft, gritty and somewhat astringent, when ripe. Owing to there being soft, they are highly perishable and cannot be transported and, therefore, the possibility of their being marketed as fresh fruits is very meager. They are, however, tasty even when dried. They should, therefore, be suitable for dehydration and work should be initiated in this direction. The large limbs of this tree are used for fencing. The trees are also planted on the boundaries for making a live fence. The wood of this tree is very strong and is, therefore, used for making agricultural implements. Kainth is a suitable rootstock for pear. Its wild plants can be topworked with pear. A regular topworking programme is already in progress in Himachal Pradesh for the last many years.